Dump all the ingredients (except the pita… that would be weird) in a bowl together and mix! The avocado should be ripe enough that it’s smush-able (that’s a technical term), and the spreadable cheese wedge will make everything nice and creamy. Then, once mixed, spread on a toasted whole wheat pita. Top with some cracked pepper if desired. Normally I would top this with spinach or mixed greens to bulk it up, but, you know, I have no food in the house. I liked this sandwich so much that I had it for lunch Monday AND Tuesday! 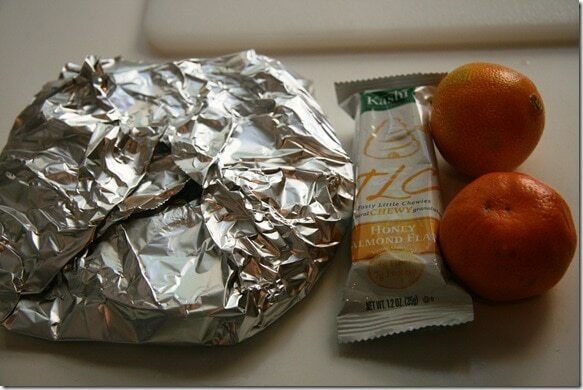 Easy, healthy, delicious, and packable for work/school. All week I have been eating a similar version for lunch! Tuna with melted cheese and guac on wrap. So good! This is SO my kind of sandwich. I can’t wait to try it!!! I have def heard of the tuna avocado mix before, and have no doubts it will be good, but I just haven’t gotten around to actually trying it. Thanks for sharing. 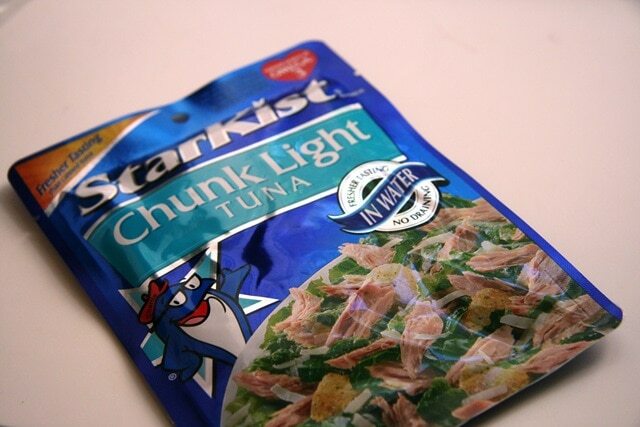 I hate hate hate hate tuna, but I bet this would also be good with canned salmon! I love your lunch ideas. This looks awesome to me! 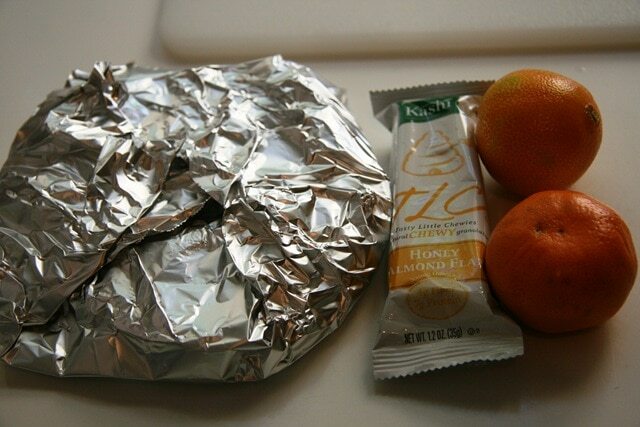 I need to bring more tuna back into my lunches. One of my favorite flavor combos? Tuna salad made with celery, a dash of red wine vinegar, a dollop of spicy mustard over a bed of mixed greens or spinach with roasted almonds mixed in. Ooo that sounds awesome! 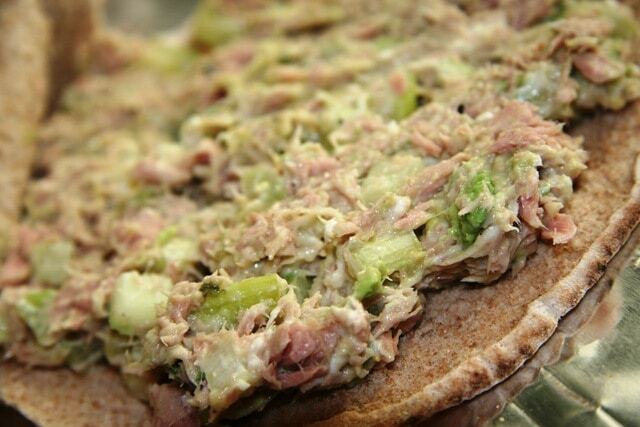 I love mustard with tuna but haven’t tried red wine vinegar… interesting idea! Cooking–and reading food blogs!–has taught me that more often than not, the less sense it makes the better it tastes! I can’t wait to try this–avocado really seems like such a great throw-in ingredient! since I don’t eat tuna, I’ll just go ahead and take your word on it!!! doesn’t sound weird to me…that sounds awesome! 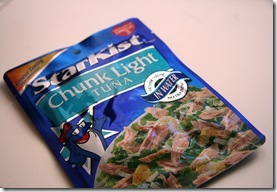 although i think i might use salmon and not tuna…the broke college years kind of killed packaged tuna for me! Not weird at all. I do this all the time and wonder if anyone else did this. Yum! Also, mixing in green onions is really good. You have great lunch ideas! And I have all but celery at home to try this tomorrow! I like tuna with a hard boiled egg white crushed in, and craisins. 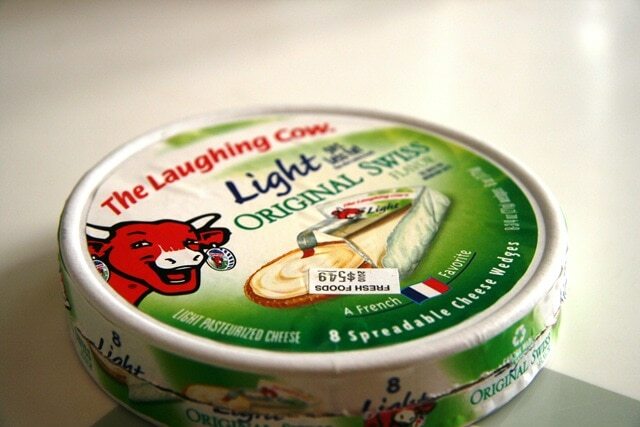 Really smart to use Laughing Cow instead of mayo to make it creamy! That doesn’t sound weird to me, at all! I think your creation sounds heavenly! I totally make this all the time – minus the avacado (which I <3). Must throw it in next time! Great idea! This looks great…I love avocado and tuna but never considered combining the two…duh! 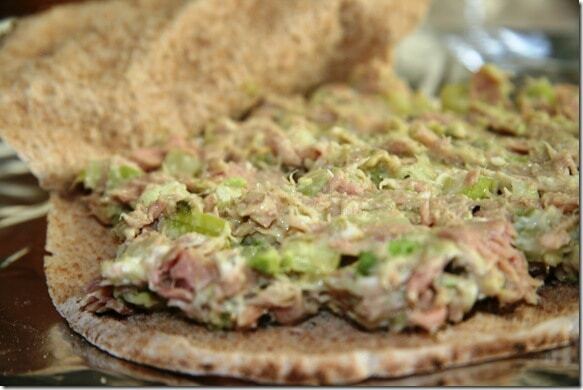 Must try this..
Another thing I love to add to tuna sandwiches is chopped up apple. The tart crisp apple goes so well with tuna and cheese. It’s a MUST TRY! This kind of reminds me of the loaded tuna melt sandwiches I made growing up. Toasted bread, cheese, tuna…nothing bad about that :) Throw in an avocado…even better! I love that you added celery! What a nice crunch! I can totally see how that would be good. tuna is also good with avocado and salsa. I have made the same thing without the Laughing Cow – I’ll try it that way! Sounds yummy! I have very little food in the house right now, but I DO have tuna and an avocado, so I think I’ll give this a try! Thanks for the recipe. Thank you. I wanted to so something with tuna and was looking for a healthy alternative to Miracle Whip. Great! I also like using nonfat plain yogurt in place of mayo in tuna/chicken/egg salad. 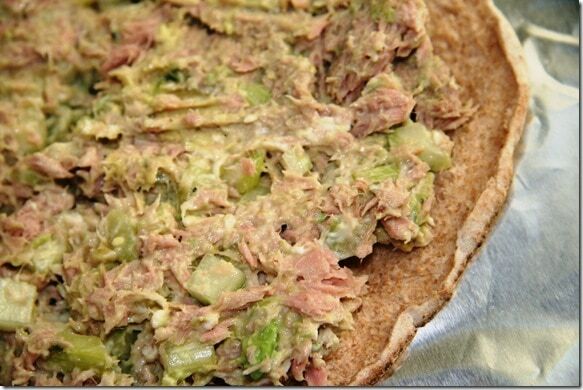 Check out my other tuna salad recipe here: https://www.fannetasticfood.com/recipes/tuna-salad-with-a-healthy-twist/. Looks absolutely delicious to me! I have heard people making tuna salad and using a mashed avocado instead of mayonnaise. I guess it is similar. Is it weird that I don’t think it looks weird? Haha YUM! This looks amazing. I found your blog via spark people! Thanks! Sounds good, putting it on my plans for lunch next week. Thanks for sharing. Brilliant! I often replace mayo with avocado (creamy with good fats instead of bad fats). I never thought of adding the LC cheese wedge though. This sounds yummy. Can’t wait to try it! I have a fennel bulb that I plan to chop and add to the salad. I bet that will be great. If it is not, I will let everyone know. I tried this last week and it was sooo good that I made it for lunch a couple times and just bought more fixin’s at the store to make more next week. Didn’t have any pitas but I put on toasted sandwich thins and served it open face, would be great on sourdough too! I like Kim’s idea of mixing in green onions and I happen to have some in my fridge so I will try that too! I feel so inspired to make new, healthy lunches! Forget the boring turkey sandwich! I am actually excited about lunch again! Thanks!!!! I didn’t have celery so I subbed green onion, and also added chickpeas for some extra full-ness. Thanks for sharing. Loving your 5 minute lunches series! Is that an Ezekiel Pita I spot? Hey thanks for the reply. And, darn. They look a lot like them. But yes you should definitely look into getting some Ezekiel pitas. They are incredibly delicious and filling. You can do a ton of things with them too because of how robust the bread itself is. You can even make breakfast pizzas. Since this is an avocado sandwich I would love to share a breakfast pizza I make with avocado with my Ezekiel pitas. You can either set the oven to bake at 300 or just turn the broiler on. I choose to use the broiler simply because its faster and easier than waiting for the oven to preheat to 300 and nobody wants to do that. Place pita in oven to crisp up for about 2-5 minutes. Make sure to keep an eye on it so it doesn’t burn. While you wait for your pita start your eggs. You can cook your eggs however you like but they are best sunny side up or fried. It is very important that you don’t leave your eggs on the fire too long. The second that you flip them turn the fire off and take them off the heat. Doing so will insure that you have time to put it under the broiler without cooking the inside too much. (You want that ooey gooey yolk in the middle because that’s what makes this awesome). Once they are both done mash your avocado and spread it on the pita (kinda like pizza sauce but with delicious avocado) place both sunny side up eggs so the cover the pita as evenly as possible. Then grate your hard cheese over top and chop up fresh time and sprinkle over the top. Place assembled breakfast pizza in the broiler until cheese is melted and not a second longer. Like i said before we want to be careful to keep the yolks nice and delicious and not let them firm up under the broiler. Once all of that is done your left with a delicious cheesy, savory, aromatic breakfast pizza that is not only full of vitamins, minerals, fiber and protein, but your left with a delicious and satisfying breakfast. I hope you try and enjoy my recipe.